Is your current job going nowhere? Have you checked into becoming a dental assistant for a fulfilling career? 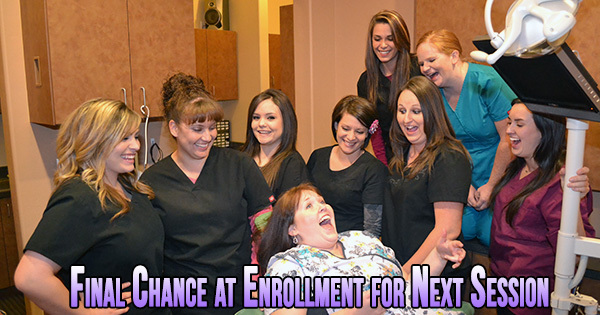 If so, then the Dental Assistant School of Nashville is right for you. At our school 30% of our students have dental assisting Jobs before Graduation! Last chance to enroll in the next session. Contact us as soon as possible before the session is full! If you’re looking for a fast paced, professional class that will give you friends for life and the best Dental assistant education anywhere around, give us a call! In between practicing new skills, learning all the new facts they’re given, and finding new friends, our students can always find time for a little fun! If you want to join our next session simply email, call (615) 988-8484 or, come visit the school today and check out our dental assistant facebook page! This entry was posted in Uncategorized by nashvilletech. Bookmark the permalink.